After a few months’ absence from my other garden, it is good to be back, especially to enjoy all the Spring colour. 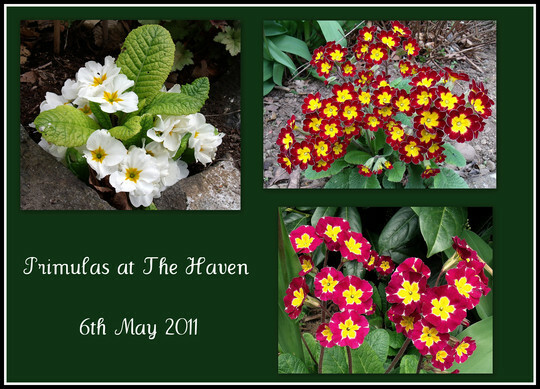 The primulas, some of which I’d brought from my own garden in May last year, are still putting on a colourful display. 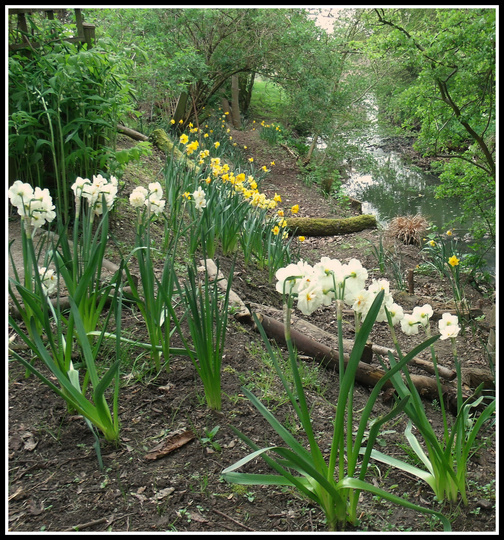 My mass planting of Narcissus bulbs along the stream embankment in Autumn has been a success. 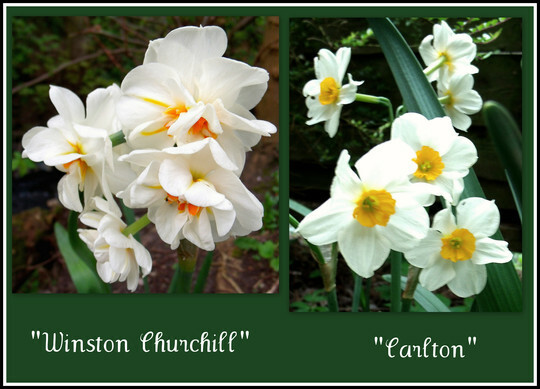 At a local garden centre, I had made up my own “pick ’n mix” style bag of white Narcissus bulbs of two varieties, “Winston Churchill” and “Carlton”, which were planted along the top of the banking. The 5kg bags of mixed Narcissus bulbs I bought at Lidl were very successful. 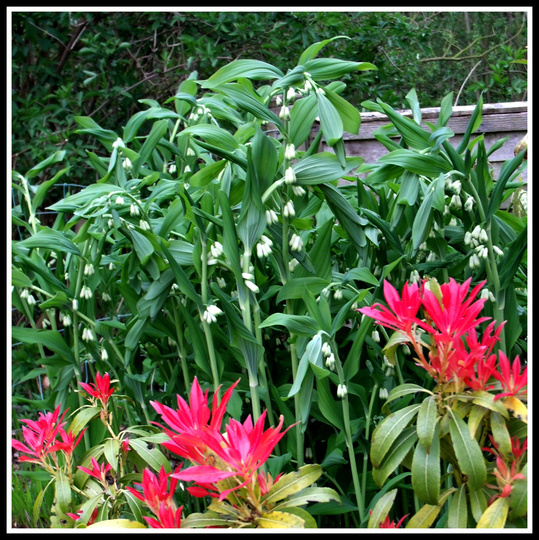 Although there were no white-flowering ones, as suggested by the picture on the label, the mix of self-coloured, orange and yellow, double- and single blooms, has been excellent. I shall get some more later this year, if available, as there is still plenty of room for more. 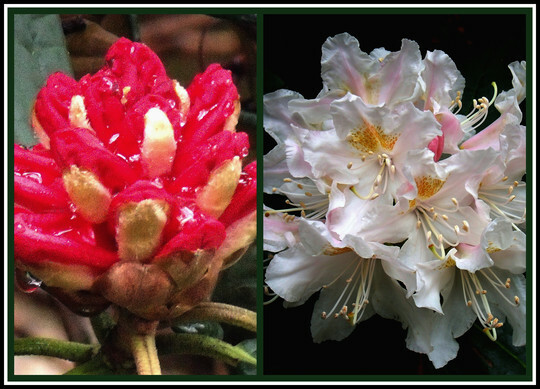 It is also Rhododendron time, with some in full bloom and others just budding. 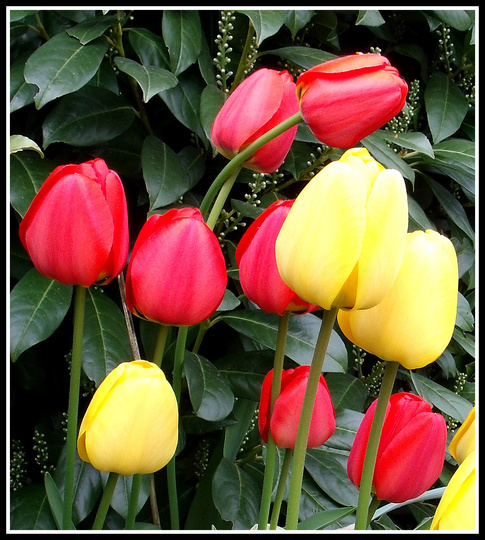 This lovely display of tulips looks especially good with the backdrop of the dark green foliage of English Laurel. I could easily have spent all of my time admiring the plants yesterday, but I did have an important task to do. 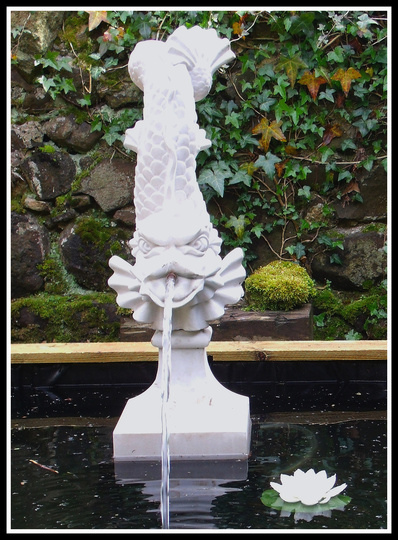 The water feature for the new lily pond in the “Hint of the Orient” garden had arrived, and I wanted to get it set up and working. I had had a lot of misgivings about Squire’s and M’lady’s choice of water feature, especially as it is titled “Dolphin”! I’ve never seen a dolphin like this one, and looks more like some sort of scaly sea serpent, or a cross between a fish and a dragon. I do think, though, that it looks a bit oriental. With a choice of 5 colours, I would never have picked this very pale grey/off-white, but they were looking ahead, and thinking of it weathering. Overall, I do really like it, however. In order to have the plinth sitting on the pond surface, I raided my own garden shed and found a metal “Long Tom” style planter, which already had a drainage hole, through which the copper pipe of the water feature would fit. I painted it with black exterior metal paint so that it would not be seen in the pool, and would also hide the hose and pump. Seems to have worked a treat! Hi David, what beautifully presented pics. The borders set your lovely photos off perfectly. I love the stream area and those tulips look wonderful - and this from someone who is not really a fan of them! Now I'm converted :o) You've been very inventive with the water feature which is looking really good. "I DON'T BELIEVE IT!!!!" as a certain Mr Mildew (sorry, meant Meldrew) would have said. Had just pressed the "publish" tab on my blog when the 'phone rang. Have had to listen to both M'lady and Squire telling me that they decided to move the water feature a few inches - and have punctured the pondliner!!! Have just ordered a repair kit online for delivery Tuesday. With the pond water level already down more than 1ft, it should, hopefully, be empty and dry for my next visit on Wednesday or Thursday. Oh David, Be honest now, I DON`T BELIEVE IT!!!! !, anyone would think it was their garden, lol. Seriously though I bet they were upset, I think its a chinese/dragon type fish and I do like it, shame you have to do all that work again. You already know I love that stream walk, its coming on so well, I have some of your choices here in my garden they are lovely, M`Lord and M`Lady are lucky to have you, saying that you have The Haven to share so I guess it goes both ways. Fantastic photo`s, good luck with the liner replacement and already looking forward to next blog..
Lovely update David. I wanted to LOL when I saw that dolphin? I can just hear it saying "Got you Davie me lad. I'm not quite in the right spot." It has a wicked twinkle in its eye. How is the allotment coming on? I hope you can successfully repair the pond liner...just a bit too much tinkering by the owners...you are very patient with their reorganization skills(? )...ferns and hostas with the path sounds a bit "formal"...alas they do appreciate your hard work. Your photos are lovely, framed as they are. I think it all looks brilliant David.....welldone. They must be chuffed with your results. They won't tinker again with the pond in a hurry I'll bet. I once decided to move a fish tank 2 inches to one side after T set it up and the side parted and there were gallons of water all over the floor in the dining room and fish jumping all over. Not done that again. I do like the fish-dragon. The photo's look great with the framing. All your photos look magnificent! Many thanks for all your lovely comments on the plants, the water feature and the framed pics. Don't know where the past week has gone, but am pleased to report back that the pool was sorted out once again, today. It was far easier, and less expensive, too, to buy a whole new liner, and starting again. The pool now has 3 layers of lining, the "dolphin" was positioned (never to be moved again, lol!) before any water went in. At last, I can look out for lilies, etc, and move on to the next "part", an adjacent decked area. Once again, Thank You all, I do appreciate the "feedback". As I have a full "day off" to myself on Sunday, and with Squire and M'lady off for a long weekend away, am planning to be at The Haven all day, doing whatever I feel like tackling, so will report back after then. We are enjoying a long weekend, it's the official "opening" weekend and Victoria's birthday...happy 24th of May, David! I wondered how the "dolphin" would fit with the rest...but you are right, it does look like it will meld into the oriental ambiance, especially when it "weathers" a little...some nice moss perhaps? Well here it is, Sunday...hope you're enjoying yourself. 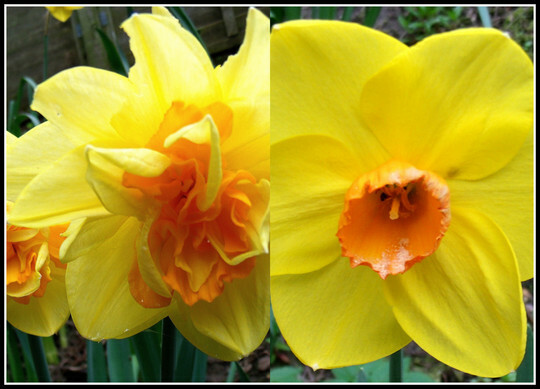 the bulbs look wonderful and you've framed the pics of the flowers ...nice software! Will check back to see what you got up to today!